Seth Garrison with a hit on Fayetteville-Perry quarterback CJ McCulley during a recent game. For what seems like the eighth time this season, the East Clinton football team will face a run-oriented opponent Friday night. The Astros will host Clermont Northeastern Friday in a SBAAC National Division matchup. East Clinton is 0-7, 0-3. Clermont Northeastern is 5-3, 2-1. Kickoff is set for 7 p.m. at ECHS. 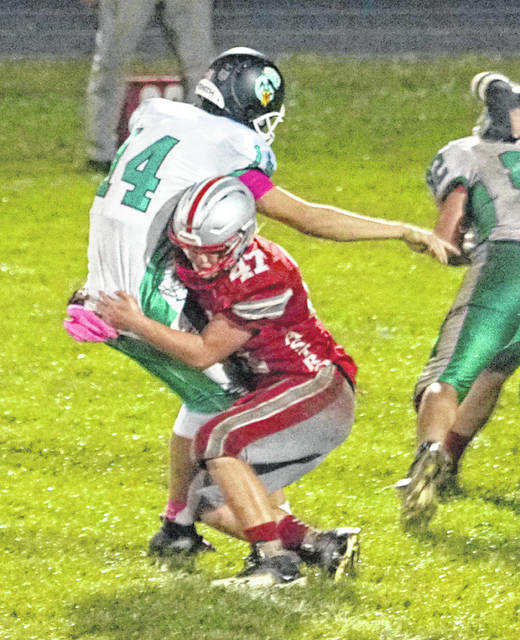 The Rockets are coming off a 20-0 defeat at the hands of Blanchester. East Clinton dropped a 61-6 decision to Bethel-Tate. The Astros season was thrown for a loop last week when prior to the team leaving for the game head coach Jeremy Yankey resigned for personal reasons. The coaching change didn’t alter much for the Astros.